Engineering students at the University of South Carolina (USC) feel so strongly about the value of SOLIDWORKS that they showed up in droves on the Saturday before finals to gain exposure to the most popular CAD tool in the industry. For them, having SOLIDWORKS skills is a must, not an option if they want to rise to the top of the list of the candidates in a competitive job market. This message is not unique to students of the University of South Carolina, Application Engineers (AEs) all over the world are in demand for putting on events where students and faculty alike receive an introduction to SOLIDWORKS. 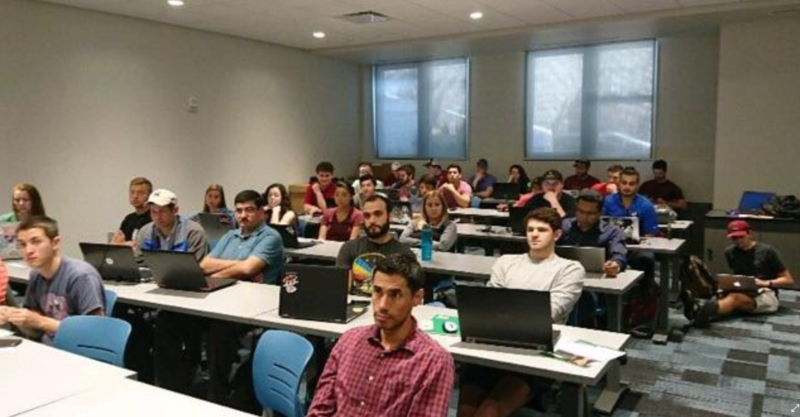 In this case, Chris Duchaine from TriMech organized an event on Saturday, April 21st at the University of South Carolina, which does not offer SOLIDWORKS as one of its CAD tools. Demand for this event was so strong that he had to cap the registration at 90 students and people stayed from noon to 5 PM. According to participants, they attended this event to get an introduction to SOLIDWORKS, to receive a student version of the software and because they believe that SOLIDWORKS certifications are a difference maker for getting hired. Let’s hear from Anil Kircaliari, ME student, President of Society of Manufacturing Engineers USC chapter, event organizer. Ready to test drive SOLIDWORKS now? Want to plan a similar event? Contact your Value-Added Reseller.